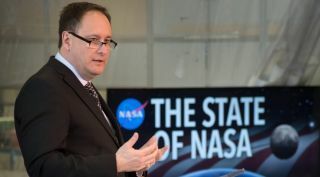 NASA Acting Administrator Robert Lightfoot discusses the agency's 2019 budget proposal at a "State of NASA" event Feb. 12. WASHINGTON – NASA's vision for lunar exploration includes landing astronauts, from NASA and its partners, on the surface of the moon by the late 2020s, the agency's acting administrator said Feb. 20. Speaking at a Space Transportation Association breakfast, Robert Lightfoot described a 2030 vision for NASA and space activities enabled by the administration's fiscal year 2019 budget request released last week, ranging from a "totally commercial environment" in low Earth orbit to exploration of the moon. The platform is the Lunar Orbiting Platform – Gateway, a human-tended facility in cislunar space formerly known as the Deep Space Gateway. That facility is one key element of the lunar exploration plans in the budget proposal, which calls for construction of an initial power and propulsion element that would be launched commercially in 2022. Another element of the plan calls for continuing a set of funded agreements with industry known as Next Space Technologies for Exploration Partnerships (NextSTEP) to study designs for a habitat module for the gateway. Several companies are currently working on habitat module designs under NextSTEP. Those initial small landers would be followed by larger missions, but how those evolve over time into spacecraft capable of carrying people to the lunar surface and back isn't described in detail in the proposal. However, that broader lunar exploration effort is expected to leverage contributions from both commercial and international partners. "What we're looking for is the latter part of the decade for humans to the moon," he said in response to an audience question about timelines. Asked if those people would be NASA astronauts or those from partner space agencies, he responded, "Yes." That overall approach to lunar exploration is based, Lightfoot said, on a 45-day report commissioned by Vice President Mike Pence at the first meeting of the National Space Council Oct. 5 outside Washington. "The outcome of the 45-day study was codified in the budget," he said. The study itself has not been released by NASA or the White House. Lightfoot represented NASA at the next meeting of the Council Feb. 21 at the Kennedy Space Center. "I'll get an opportunity to brief the other Council members on what we did from our last action, the 45-day study," he said. "We'll see where it goes from there." He added he was looking forward to discussion on regulatory reform at the meeting, an issue that has only peripherally involved NASA. In his speech he discussed another element of that vision, transferring activities in low Earth orbit to the commercial sector. That includes ending NASA funding of International Space Station operations by the mid-2020s, while stimulating the development of commercial capabilities through a program that the budget proposal projects spending $900 million on over the next five years. "Industry is ready. They feel like they're ready to take that on," Lightfoot said. "We need to get things on orbit that we can go to other than government-funded locations." That proposal generated criticism even before the formal release of the budget proposal, with several key members of Congress opposing any effort to end ISS funding in 2025. Ligthfoot alluded to that in his comments. "I think this will drive a great discussion, in my opinion, around when is that time to get off the station and have something available," he said. "Based on my phone calls that I made about the budget, I'm sure this is going to get a lot of conversation on the Hill." Lightfoot said he's also had "plenty of conversations" with the station's international partners about the proposal. More are planned for the Second International Space Exploration Forum scheduled for March 3 in Tokyo. "I've got meetings with all our partners next week, individually," he said. "They all understood where we were and what we were doing, but wanted to talk about it."